Yardman Snow Blowers come in a variety of sizes to suit the needs of various snow clearing jobs, contractor requirements and consumer requirements. You can select Yardman Snow Blowers from light duty models, moderate duty and heavy duty depending on your snow clearing needs. Contractors who clear snow all winter long will likely choose heavy duty machines for their business. They need machines that can handle the daily harsh treatment of blowing snow, loading and unloading and generally rough treatment by employees. Consumers on the other hand can use light or moderate duty machines depending on how much snow you receive each winter and how deep the drifts are. They tend to purchase smaller machines due to storage issues and the reality of clearing only one driveway even if it is two car widths wide and a normal length. 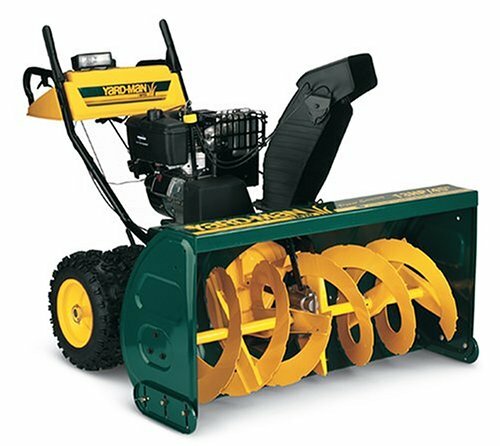 Moderate duty Yardman Snow Blowers come in 26 and 28 inch widths . They can handle double driveways with snow from 6 to 12 inches in depth easily. Steel augers and a high speed impeller can deal with most snow conditions including hard packed snow conditions. The Yardman Snow Blower moderate duty snow blower comes with manual and electric start. Also 6 forward and 2 reverse gears, manual chute and crank over 180 degrees. There is a 12 inch impeller, 15 inch tires, space saving folding handles, polymer chute with a 2 year warranty. More room is required to store one of these machines since they are larger in width. They are the typical snow blower that many consumers will consider for their personal use. The heavy duty Yardman Snow Blower can handle snowfalls over 12 inches with ease, 30 inch width, electric and manual start, 6 forward, 2 reverse gears, manual chute and crank, 12 inch auger and impeller, 16 inch tires, polymer chute, oil prefilled engine and a 2 year warranty. The engine is a 4 cycle winterized 357 cc engine. Yardman Snow Blowers are all coated with durable automotive style powder coated paint. With the additional width, operators can make short work of driveways and pathways when clearing snow. Storage of any of these machines should be considered. Many people have one or two cars and space for only one or two cars in their garage. Unfortunately builders do not allow for much more than space for a car in today’s homes. A snow blower takes up a lot of room. Many people just do not have the space unless they leave their car outside on the driveway. This is a common thing for many people since their garage is filled with other outdoor maintenance activity equipment. We find that many families will have two cars. They will park their cars on he driveway or even on the street to make it easier to navigate around. In the winter time many cities and towns have bylaws in place that prevent parking on the street during the evening and night time hours. This makes the clearing of streets easier. This is an inconvenience for many people. However it is the only way to arrange for narrow streets to be cleared of snow. Each year the names, specifications and model numbers are changed and updated by all of the manufacturers. We have decided to describe the basics of each snow blower in the title to make it easier for readers to review all of the machines. This Yardman 357cc 28inch Electric Start snow blower comes with an electric starter a wide 28 inch cleaning width and a full 21 inch intake height. This snow blower will be suitable for most residential applications where you are clearing snow from your driveway and walkways around your home. The Yardman 357 cc 28 inch snow blower has a stell shave plate to help you scrape snow right down to the pavement, knobby tires to get a good grip while blowing snow and a headlight for blowing snow at night. Skid shoes make sure that your snow blower slides along smoothly. They can be adjusted to the height that you prefer and replaced if they become worn down. Most customers will have to arrange for delivery of their new snow blowers. They are far too big to take home in your car. So you will need a trailer, rent a van or arrange for delivery by the store that you are purchasing the snow blower from. There will be a charge for this service. Most snow blowers can be purchased with tire chains to provide extra traction in icy situations. In addition, snow shields are also a good idea. You can protect yourself from windy conditions and snow being blown back at you from the wind. 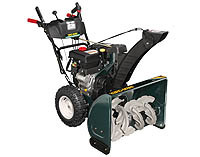 They can be purchased for most snow blowers including the Yardman 357cc 28inch Electric Start. 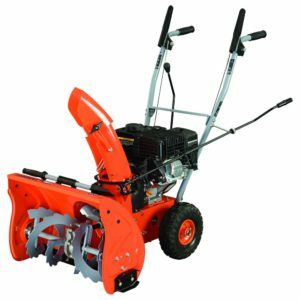 Online Reviews: We were unable to find any online reviews for the Yardman 357cc 28inch Electric Start Dual Stage Snowblower, however please leave your comments at the end of this blog if you have used one of these machines. Carefully read all of the safety guidelines in the manual prior to operating the machine for the first time and follow these guidelines to ensure that both you and the machine do not have an accident. Prior to starting the Yardman 357cc 28inch Electric Start Dual Stage Snowblower the first time each day, perform a quick walk around check of the machine to ensure there are no loose parts and no leaking fluids. Check the engine oil to ensure that it is at the correct level as specified by the manual. Top up if necessary. Fill the fuel tank while the engine is cold and prior to using the machine. If you do spill fuel, wait until it has fully evaporated prior to starting the engine. Never spill fuel on a hot engine to avoid fires and always fill the fuel tank outdoors to avoid any possibility of vapors going into your house. Finally never point the chute in the direction of people, buildings or cars to avoid any possible damage and accidents. One of the features on the Yard-Man Snow Thrower H55LH is really a must have feature. When you are blowing snow off your driveway in minus 30 degree weather you will want this feature. If you have ever been out blowing snow in this kind of weather, you just cannot dress warm enough to stay out there long. Your fingers and your toes are the first thing to start freezing, regardless of how warm your gloves and foot ware are rated. The Yard-Man Snow Thrower H55LH cannot do much about your toes , but it can do something about your fingers. What we are talking about is the feature called ” Heated Handle Grips”. With this feature your hands and fingers will stay warm no matter what the temperature. 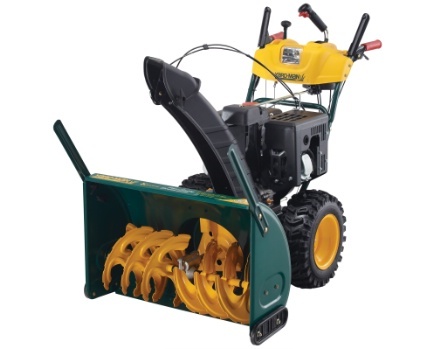 This has got to be one of the best features available on the Yard-Man Snow Thrower H55LH. Other features such as electric start, folding handles and accessories such as a snow cab will enhance your snow blowing experience and comfort. There is no need to manhandle this snow thrower in the direction you want to go. Simply press the trigger switch and the snow thrower will go in the direction you desire. Let the snow blower do the work with you steering with your finger tips. Transmission: 6 forward , 2 revers speeds to match the snow load and your preferred pace. From single hand controls to 12 inch augers and impeller, the Yard-Man Snow Thrower H55LH can blow even the toughest snow drifts. Equipped with Tool-Less drift cutters, you can cut through snow drifts that are much deeper than the 21 inch intake height of this snow thrower. Six forward gears allow you to set the speed that is most comfortable for you as well as the snow blower depending on the amount of snow that needs clearing. Assembly of the Yard-Man Snow Thrower H55LH only takes minutes, the oil is already in the engine and you just need to add fuel to the fuel tank to be ready to go. The in dash yard light will assist you at night with clearing snow on a dark driveway and sidewalk. Snow can be directed in any direction with the 4 way chute that rotates from side to side and up and down. The Yard-Man Snow Thrower H55LH can be purchased at Home Hardware stores across Canada. Customers can arrange for delivery or arrange for pickup of their snow blower and save the cost of delivery. Snow Cab – fits all Yard-Man models except the 380 series. It will also fit most other brands as well. The mounting hardware is included and assembles in minutes. It is constructed from heavy duty vinyl as well as freeze and rip resistant woven polyethylene. The snow cab will protect operators from sub zero wind chills and blowing snow. Snow Cover – is ideal for customers who do not have the room to store their Yard-Man Snow Thrower H55LH inside. Protect your investment from the elements during the season as well as off season. UV treated, triple edge binding and rot and mildew resistant, this snow cover will protect your investment for many seasons. Always read the manual before operating the Yard-Man Snow Thrower H55LH for the first time. Even though the engine comes with oil already installed, check the engine oil level before you start it for the first time. In fact you should get into the habit of always checking the oil each time before you start the engine. A good habit to form is a complete check of the snow thrower before you use it each day. Check for loose bolts and covers. Make sure that there is no frozen ice in the auger area or impeller area. Clear it if there is. Top up the fuel tank to avoid stalling in the middle of your snow clearing for the day. Never point the chute in the direction of another person or a car or even the house. Sharp pieces of ice or even small stones can be blown out of the snow blower, becoming high speed projectiles which can do a lot of damage. When you are finished for the day, clean all of the snow and ice off the Yard-Man Snow Thrower H55LH before storing it away or covering it with the snow cover. This will help to preserve the housing for many years of use. Always shut the engine off before trying to clear blocked snow or ice from the auger or impeller area. These are powerful machines which can do a lot of damage in a hurry if you are not careful. Follow the manufacturers instructions in the manual for routine maintenance including oil changes and lubrication points. Change the oil at recommended intervals, and at least once per year to maintain a clean engine that will last a life time. Oil changes are pretty straightforward. Just follow the instructions in the manual and use the recommended oil for the Yard-Man Snow Thrower H55LH engine.